The Office for National Statistics reports that productivity has fallen again the 3rd quarter of 2012, the fifth consecutive quarterly decline in productivity. The fall in productivity is a function of rising hours worked and stagnant output. In the last 5 quarters output has risen by just 0.6% while hours worked have risen by 3.4%. 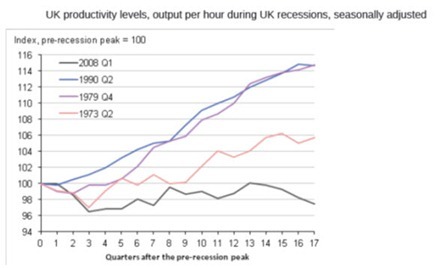 Falling productivity is extremely unusual coming out of recession, as firms usually begin increasing output long before they increase hiring or hours. It has sparked a widespread debate on the ‘baffling productivity puzzle’. On this measure, this is the worst performance of all recessions since the 1990s. A trend fall in productivity would have very serious negative consequences for long-term growth prospects. While the effect of austerity policies is to transfer incomes from labour and the poor to capital and the rich, a decline in output per hours worked would reduce the overall level of national income, or require an increase in hours worked simply to avoid economic contraction. But the decline in productivity may be less mysterious than is widely suggested. 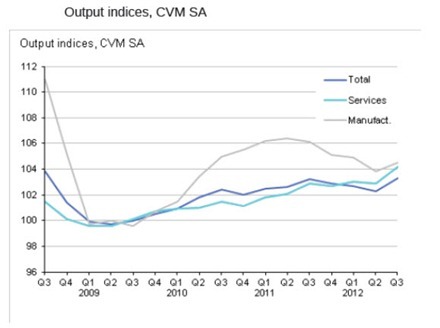 George Osborne promised to preside over a ‘march of the makers’ but as Fig.2 below shows services output has been a gently rising incline. It is manufacturing output that has fallen. Productivity, in terms of output per hour worked is significantly higher in the manufacturing and production sectors than in the services sector. The decline in manufacturing output would tend to lower the total productivity of the whole economy. In addition, energy extraction has a far higher productivity rate than manufacturing or the economy as whole, 12 times greater. 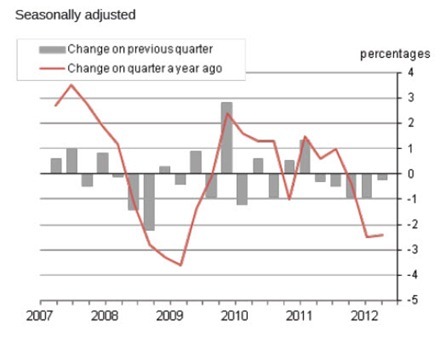 Energy extraction has fallen by 7.9% over the last 5 quarters. However manufacturing has been in a long-term decline. Even when all components of production are taken together, manufacturing, energy, utilities and construction account for less than 23% of all output in the British economy. The relative fall in manufacturing output cannot account for the fall in productivity for economy as whole. SEB has consistently argued that the source of the current crisis is the investment ‘strike’ by firms. The refusal of firms to invest accounts for the entirety of the fall in output since the recession. But this has a corollary, which points to how the crisis might be resolved. Firms have been hoarding capital, not investing. This increase in the savings of the corporate sector could provide the resources to fund an increase in investment. In a normally functioning market economy private firms borrow to invest. 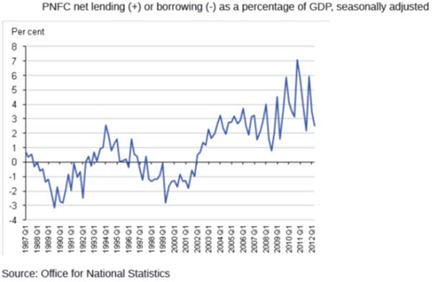 But hoarding capital means the corporate sector has reduced its borrowing and increased its net savings. The chart in Fig.4 below shows the net savings of the non-financial corporate sectors, that is firms except banks and financial institutions. The corporate sector has been saving throughout the crisis. In fact, this saving is the counterpart of the refusal-to- invest [which] is the cause of the crisis. The ONS reports that one-third of all private sector firms are maintaining higher levels of employment than they needed in order to meet production. Firms who refuse to invest are holding onto to workers in expectation of an upturn, although employment is increasingly part-time and casualised. Real wages have also fallen continuously since 2008. Labour is becoming cheaper and more instantaneously disposable. Reducing the outlays on employment, by firing workers or placing them on short-time is clearly easier and less risky than reversing an outlay on major capital investment. Firms can also fund higher levels of net employment because of capital-hoarding. But clearly this is not sustainable and firms’ savings may already be falling. Without a sustained upturn in output, the risk must be that unemployment will rise sharply or that real wages and full-time employment will fall further. The fall in productivity highlights the central importance of the investment strike.